(Nanowerk News) Sometimes, it seems as if molecules struggle to communicate with scientists. When it comes to junction plasmons, essentially light waves trapped at tiny gaps between noble metals, what the molecules have to say could radically change the design of detectors used for science and security. Single molecule detection sensitivity is feasible through Raman scattering from molecules coaxed into plasmonic junctions. Scientists at Pacific Northwest National Laboratory (PNNL) found that sequences of Raman spectra recorded at a plasmonic junction, formed by a gold tip and a silver surface, exhibit dramatic intensity fluctuations, accompanied by switching from familiar vibrational line spectra of a molecule to broad band spectra of the same origin ("Vibronic Raman Scattering at the Quantum Limit of Plasmons"). The fluctuations confirm the team's earlier model that assigns enhanced band spectra in Raman scattering from plasmonic nanojunctions to shorting of the junction plasmon through intervening molecular bridges ("Raman Scattering at Plasmonic Junctions Shorted by Conductive Molecular Bridges"). "It's all about asking it the right questions and listening to what it has to say," said Dr. Patrick El-Khoury, who has been working on this project for 2 years. A host of emerging state-of-the-art devices and instruments rely on molecule-plasmon interactions. Recent works demonstrated yoctomolar detection sensitivity in Raman scattering from plasmonic nanojunctions, or the ability to detect 1 molecule in 602,214,000,000,000,000,000,000. Plasmonic sensors operating at this detection limit are able to determine the chemical identity of minute quantities of radioactive and environmental hazards. The development of single molecule chemical nanoscopes could answer fundamental questions about physical and chemical processes taking place over nanometer length scales. The fundamentals gained from this study could impact the design of ultrasensitive plasmonic sensors and chemical nanoscopes used to understand the fundamental chemistry behind energy storage and production, as well as the blueprints of extremely tiny electronic devices. "Before you can engineer the devices you need, you need to know how molecules behave over length scales comparable to their characteristic dimensions. Our research is fundamental, providing novel insights into how molecules interact with junction plasmons," said Dr. Wayne Hess, a chemical physicist at PNNL. The team began with a thin sheet of glass. They grew a thin layer of silver on top of it. They added a single layer of 4,4'-dimercaptostilbene (DMS), a molecule that bonds with one of its two thiol moieties to the silver surface. They placed the sample on an inverted optical microscope, on top of which an atomic force microscope (AFM) is mounted. The gold AFM probe is engaged and set to be in contact with the sample surface. A green laser beam is very tightly focused through the microscope objective, travels through the glass and thin metal film, and excites the junction formed between the AFM tip and the sample. The team then recorded sequences of Raman spectra from DMS molecules in the junction. 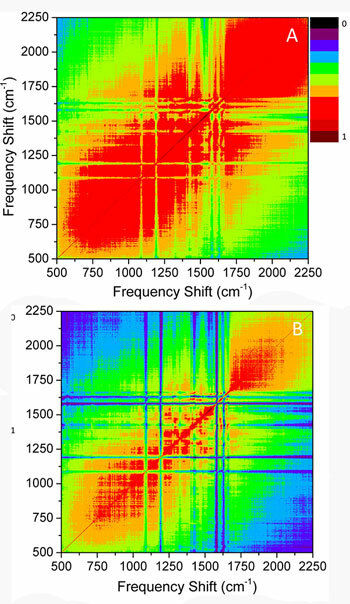 A two-dimensional correlation analysis of the recorded spectral sequences revealed that the observable vibrational states of DMS can be divided into two sub-sets, by virtue of the symmetry (C2h) of the reporter the team specifically selected for this study. The first set comprises the totally symmetric (ag) Raman allowed vibrations that are neither correlated with each other nor with the current-carrying plasmons. The second set consists of weakly allowed bu modes, which are correlated both with each other and with the plasmons. These observations clearly demonstrate that tunneling plasmons modulate the vibronic coupling terms from which the intensities of the bu vibrations are derived. In effect, El-Khoury and Hess identified gateway vibrational modes for mediating charge shuttling across a plamonic gap through conductive molecular bridges. "This is a paradigm shift in molecular spectroscopy, as we are no longer after molecular properties. Rather, we use those properties -- in this study, the symmetry of the observable vibrational modes -- to tell us about the rich environments in which molecules reside," said El-Khoury. Using the fundamental knowledge gained from this study, El-Khoury and Hess are designing novel plasmonic sensors and working toward developing an ultrasensitive chemical nanoscope. More specifically, they are developing novel instrumentation that takes advantage of the unique properties of charge-shuttling plasmons.